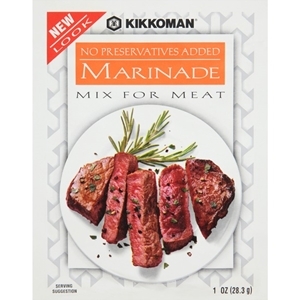 Great for flank, chuck or round steak. Add water and marinate according to package directions. Dissolve mix in water in shallow pan. Pierce surface of meat deeply and thoroughly with fork. Add meat to marinade, turn over several times to coat both sides. Marinate at room temperature according to time chart and turn over occasionally. Do not over marinate. Broil or grill to desired doneness. Salt, modified corn starch, dehydrated soy sauce (soy sauce (wheat, soybeans, salt), maltodextrin, salt), dextrose, maltodextrin, paprika, spices, caramel color, onion, garlic, autolyzed yeast, partially hydrogenated cottonseed and soybean oil, hydrolyzed wheat gluten, caldium silicate (as anticaking agent), papain, disodium inosinate, disodium guanylate, lactic acid.